Consistent, persistent and super efficient: Mr. Bundesliga Robert Lewandowski powered past his striking opponents in 2017/18, pulverising the competition to propel Bayern Munich toward one more top-flight title while claiming the prize of a third Torjägerkanone in the process. bundesliga.com scans through the season’s highs and record-breaking feats of the division's deadliest marksman over the past nine months, and asks what’s next for the prolific Polish goalscoring great. Hell hath no fury like a Bundesliga legend scorned. Plotting his response to narrowly missing out on the top-scorer's prize to former Borussia Dortmund striker Pierre-Emerick Aubameyang last time out, Lewy worked even harder on his famously lean physique and lightning-quick feet over the summer months. Blasting back with clear intent at the beginning of the current campaign, the 29-year-old was straight off the mark on Matchday 1, scoring in the second half as Bayern beat Bayer Leverkusen on opening night. Despite faltering results over the subsequent months leading to coach Carlo Ancelotti's eventual dismissal, one top-flight regularity remained: Lewandowski kept on scoring. Yet with the burden on the Warsaw native's shoulders great and a fixture list firing forth games in three competitions at a relentless rate, the returning Jupp Heynckes wisely summoned forward relief in the form of Hoffenheim's Sandro Wagner. Watch: Does Lewandowski make your Bundesliga Team of the Season? The shrewd move allowed Lewandowski to remain in his assured groove. The hair briefly changed to silver, but his golden form in front of goal remained. A productive February preceded two hat-tricks in the space of three March weeks, the Warsaw warrior weighing in with trebles against Hamburg and former side Borussia Dortmund in Der Klassiker. In all, he finished the recently concluded Bundesliga season with 29 goals. Matchday 24 saw Lewandowski reach Bundesliga game number 250. Just two games later and the striker moved out on his own as Bayern Munich's all-time top foreign goalscorer with 142 goals (currently 150). 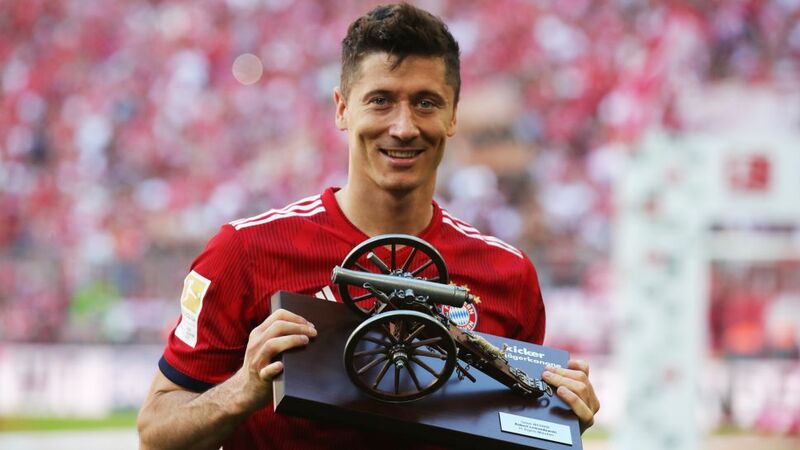 He is seventh on the Bundesliga's all-time top-scoring list and now has his hands on a third Torjägerkanone, one of only four players to win the award for deadliest marksman on three or more occasions. "I assume that Lewandowski will break my Bundesliga goalscoring record in the next two or three years. I got 220, so I think he'll be there or thereabouts in two or three more years." - Departing Bayern coach Jupp Heynckes. "We know what we have in Robert Lewandowski, I'm very happy he's still on a long-term contract. It doesn't need to be given any thought. He'll be a Bayern player next season." - Bayern Munich CEO Karl-Heinz Rummenigge responds to transfer speculation surrounding the striker. A minor end-of-season-tiff with Heynckes aside, this has been one more season to remember for a man who has earned his place on Bayern's wall of legends. Now holding six Bundesliga titles - four with Bayern - and chasing a third DFB Cup win, a first UEFA Champions League winner's medal will be one of the targets next season, building on his 150 goals in 194 appearances for Bayern, another. Prior to that, Poland's captain and leading marksman will proudly lead his nation out at the FIFA World Cup finals in Russia. Click here for more Bayern Munich news, views and updates!